Gwyn Ashton is a guitarist, singer and songwriter, who in 2001 was voted the third best guitarist of the year by readers of a French guitar magazine (Jeff Beck and Gary Moore were the top two). He has his own signature guitar model from Italian firm Liutart. His last album was "Two man blues army", released in 2009. Since then he's toured extensively in support of the album - I saw him perform supporting Magnum on tour in 2011 and was impressed by his ability and music. Often albums by guitarists are released to show off how well they can play, and some songs are sketched in around the guitar parts to pretend its a real album. There are plenty of exceptions - guitarists such as Herman Frank have released some great albums with strong songs, but sadly plenty others really do fall into the "crap songs, great guitar playing" category. 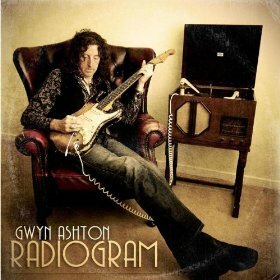 Happily Gwyn Ashton is definitely in the great songs, great guitar playing category. There's no doubting the brilliance of his guitar work here, but the guitar work forms part of some really strong well written blues rock songs. There are a number of guests on the album - Don Airey (Deep Purple, Rainbow, Whitesnake, Black Sabbath), Kim Wilson (Fabulous Thunderbirds), Robbie Blunt (Robert Plant, Bronco, Silverhead), Johnny Mastro (LA’s Mama’s Boys), Mark Stanway (Magnum, Phil Lynott), Mo Birch (UB40, Go West, Culture Club) and young up-and-coming guitarist Henry Parker. If you're a fan of Blues-Rock then this is an album I'd definitely recommend - an excellent album.